AUTOGEN_DENSITY setting in fsx.cfg and autogen slider in FSX settings. How to set it for the best performance and quality? AUTOGEN_DENSITY code in fsx.cfg shows the position of autogen slider in FSX settings. Each step takes out 20% of autogen. Just set the slider or change fsx.cfg value (remember that changing FSX settings may change some of fsx.cfg tweaks so it’s safer to make your changes directly in the file). Dense autogen may have adverse effect on FSX performance. The effect changes with the location and the scenery you use. 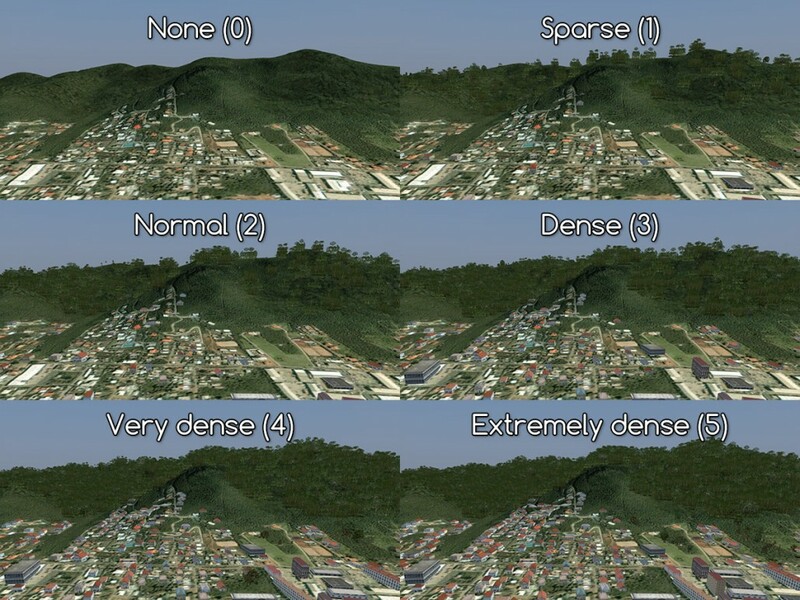 A modern (2015) PC should have no problems running default FSX scenery at Extremely dense setting (AUTOGEN_DENSITY=5). If you use add-on sceneries adjust density setting to your scenery and to the place where you fly. Extremely dense autogen causes no harm over desert but may crash your FSX when flying over Canadian forests. View gets better as the density grows. There are basic settings that should be adjusted for scenery requirements and possibly – the weather. In some cases AUTOGEN_DENSITY=5 will be out of range even in the best PCs (because of OOM risk in 32-bit application like FSX). Low-end PCs may run autogen at AUTOGEN_DENSITY=4 without a problem if the scenery allows it and if other factors affecting performance are not at play. After years of tests on several different PCs I can say that AUTOGEN_DENSITY=4 is the safest setting and gives an acceptable autogen density. If you use default scenery – add 1 to the settings above. For freeware sceneries – sometimes it’s safe to add 1, sometimes you need to lower the setting. The lower the better… NO! It’s tricky how the autogen causes performance problems but my observation is that in many cases the difference between sparse and very dense autogen can be negligible. If you look for performance boost – make sure that you aim in the right direction. If you experience FPS drops flying in bad weather – changing autogen to sparse will probably make no difference – resources released will be too small to cause better FPS. On the other hand – if the problems increase when you are close to a large city or a forest – you should adjust autogen settings. I fly at AUTOGEN_DENSITY=5 or AUTOGEN_DENSITY=4. But there are a few sceneries where I go as low as 3 (Dense). It happens mostly over freeware sceneries that use unoptimized autogen and over some payware sceneries where autogen is too “heavy”.